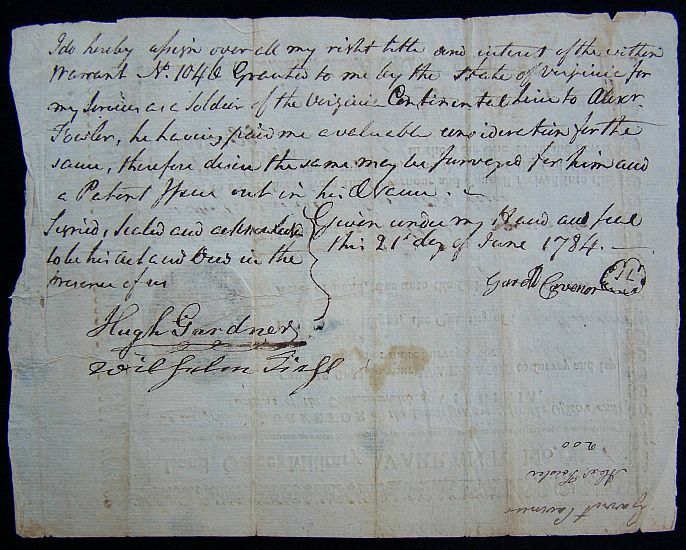 note: Edmund Little would do his part in the war as an ensign in Colonel Jedidiah Preeble’s Regiment in Canada during 1758. 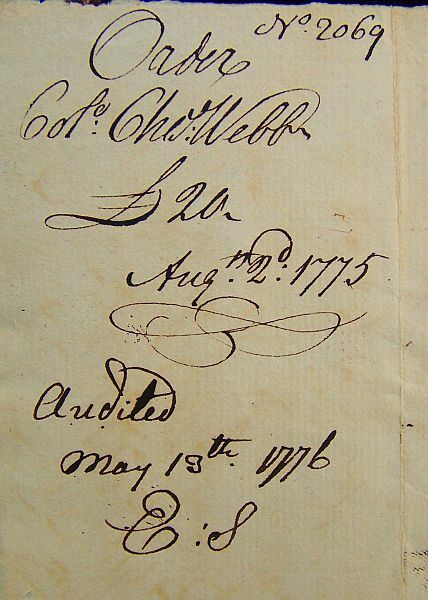 Sir, Pay Col. Charles Webb, as Paymaster of the 7th Company in the 7th Regiment now raising in this Colony, Twenty Pounds many in Bills, and charge the same Acct. 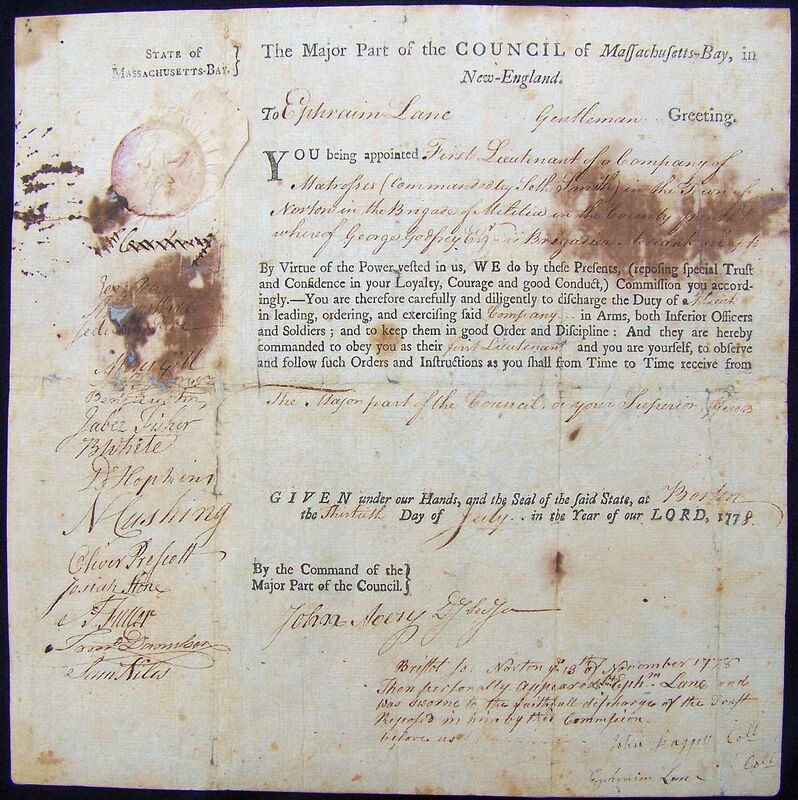 of the Colony of Connecticut August 2nd, 1775. 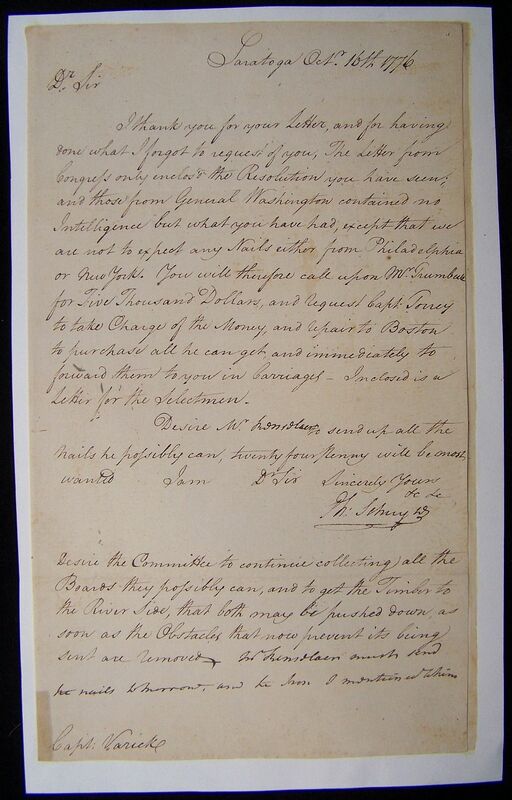 I thank you for your Letter, and for having done what I forgot to request of you, The Letter from Congress only enclos’d the Resolution you have seen; and those from General Washington contained no Intelligence but what you have had, except that we are not to expect any Nails either from Philadelphia or New York. 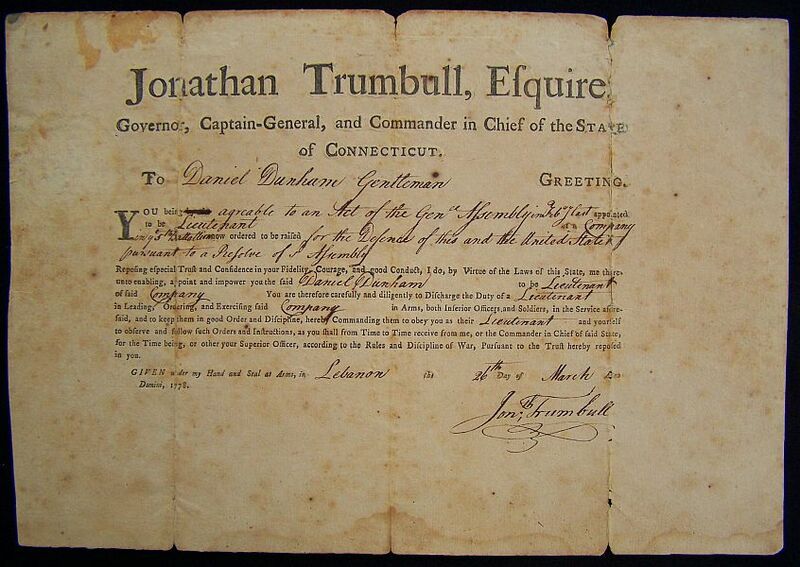 You will therefore call upon Mr. Trumbull for Five Thousand Dollars, and request Capt. Torrey to take Charge of the Money, and repair to Boston to purchase all he can get, and immediately to forward them to you in Carriages. Inclosed is a Letter for the Selectmen. Desire the Committee to continue collecting all the Boards they possibly can, and to get the Timber to the River Side, that both may be pushed down, as soon as the Obstacles that now prevents its being sent are removed. Mr. Renselaer must send the nails tomorrow, and the Iron I mentioned to him. The Major Part of the COUNCIL of Massachusetts-Bay, in New England. To Mr. Seth Phillips Greeting. 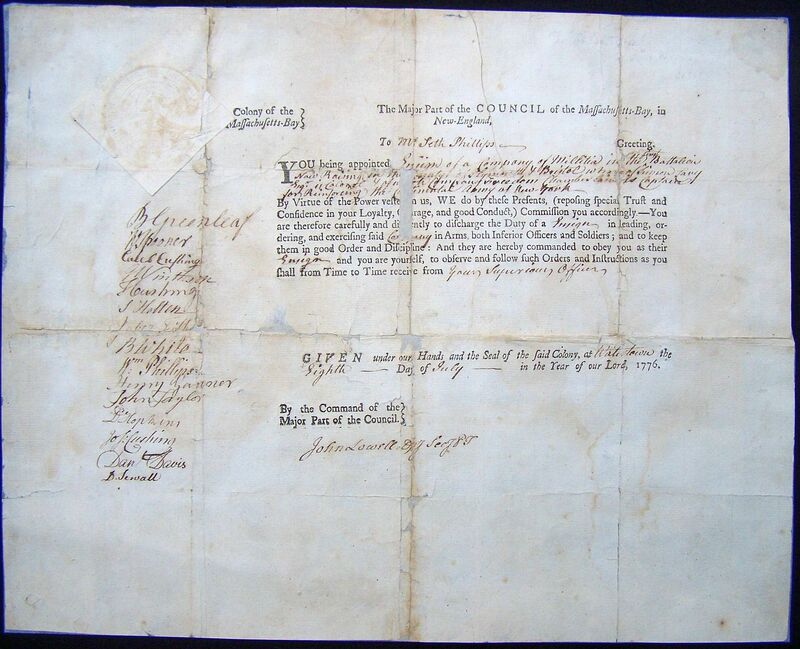 You being appointed Ensign of a Company of Militia in the First Battalion now being raised in the countys of Plymouth & Bristol where of Simeon Cary Esq. is Colonel & of which Company Freedom Chamberlain is Captain for reinforcing the Continental Army of New York. By Virtue of the Power Vested in us, We do by Presents, (reposing Special Trust and Confidence in your Loyalty, Courage, and good Conduct,) Commission you accordingly. 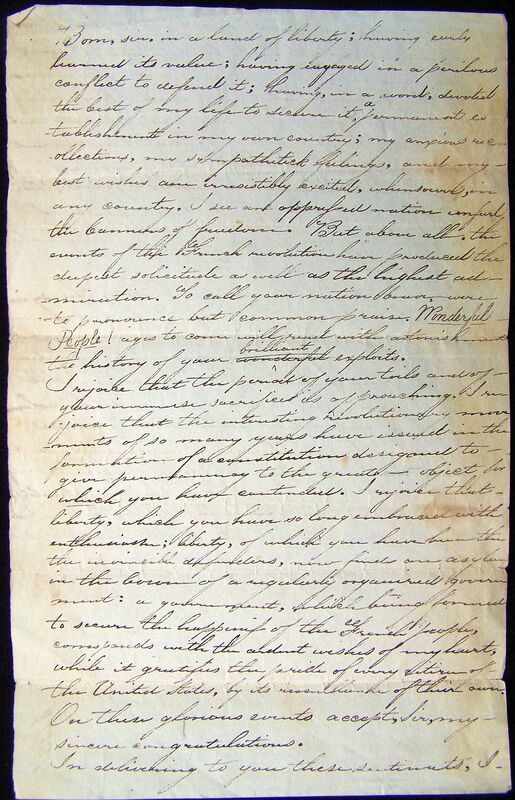 You are therefore carefully and diligently to discharge the Duty of a Ensign in leading, ordering, and exercising said Regiment in Arms, both Inferior Officers and Soldiers; and to keep them in good Order and Discipline: And they are hereby commanded to obey you as their Ensign and you are yourself, to observe and follow such Orders and Instructions as you shall from Time to Time receive from The Major part of the Council or your Superior Officers. 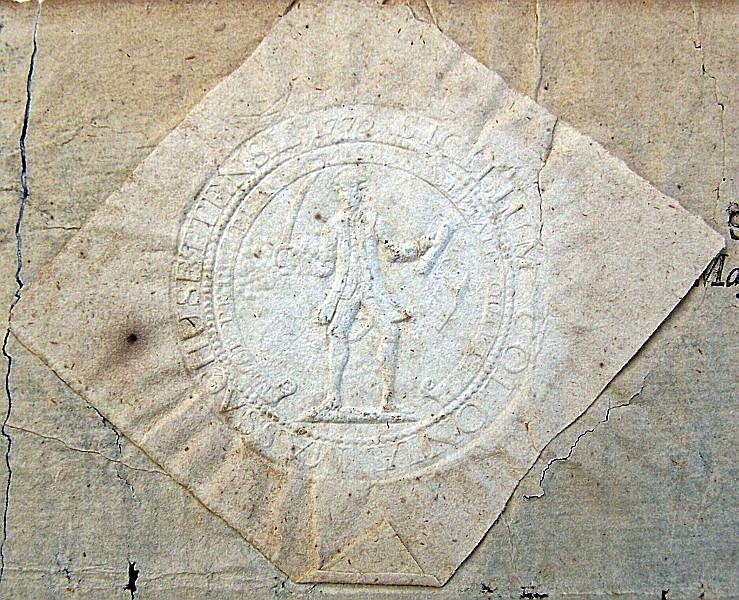 GIVEN under our Hands, and the Seal of the said State, at Watertown the Eighth Day of July in the Year of Our Lord, 1776.
note: Seth Phillips of Pembroke was a Sergeant in Captain Eleazer Hamblen’s Company and started his service on May 1, 1775. The document was signed in Watertown and not Boston. 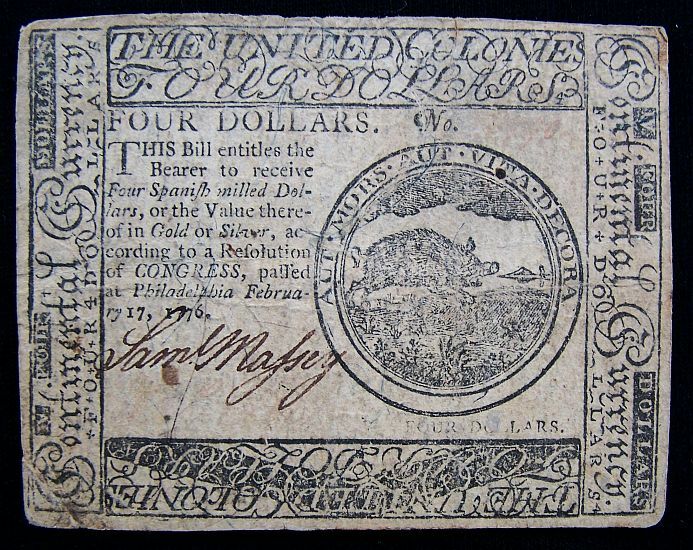 The British had just evacuated Boston in March and the government hadn’t made it back to the capital. I think a small pox epidemic had also infested Boston around this time. 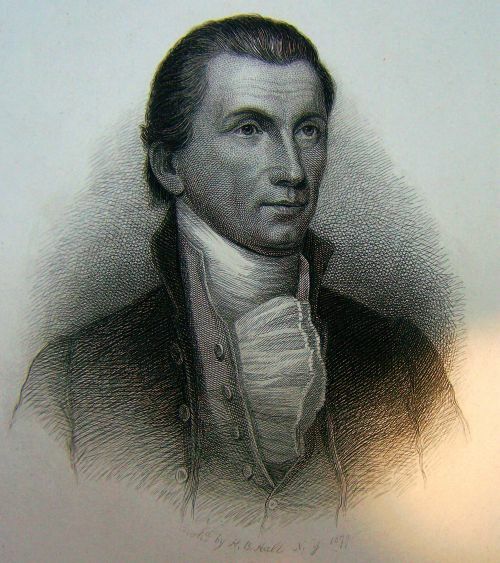 Freedom Chamberlain would start his service as a Captain in the Thomas Massachusetts Regiment from May to December 1775. 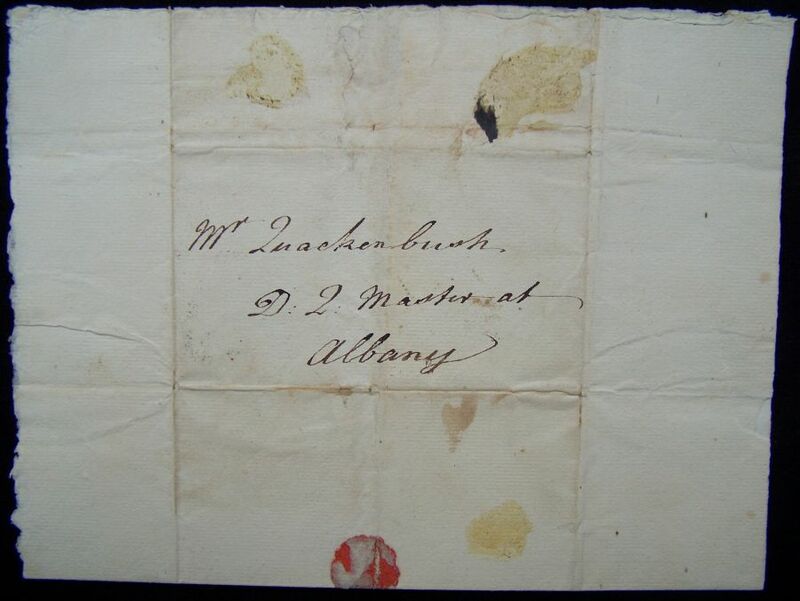 General Lincoln desires me to inform you that he paid when he was at Bennington, to Colo. Abel Marsh three hundred forty four pounds, sixteen shillings and four pence for eleven Yoke Oxen delivered Genl. Bailey for the military under his command. As the Genl. desirous to Settle with the paymaster he would be glad you could contrive to settle with him as soon as possible. 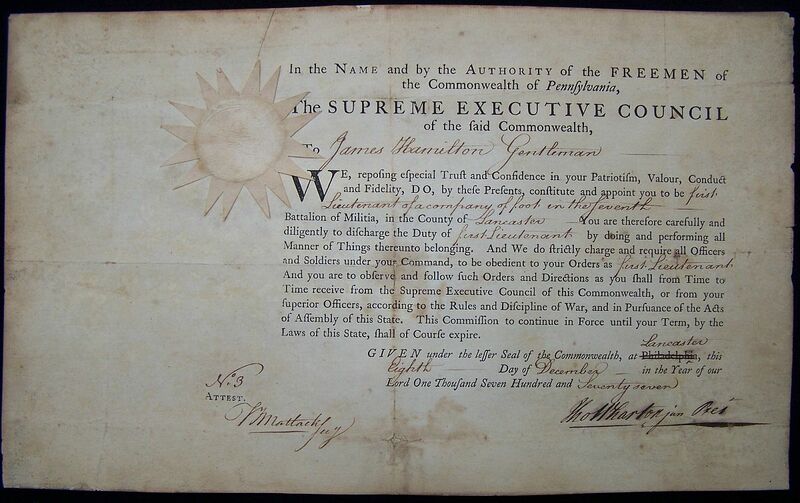 We, reposing especial Trust and Confidence in your Patriotism, Walor, Conduct and Fidelity, DO, by these Presents, constitute and appoint you to be First Lieutenant of a Company of Foot in the Seventh Battalion of Militia, in the County of Lancaster. You are therefore carefully and diligently to discharge the Duty of First Lieutenant by doing and performing all Manner of Things thereunto belonging. And We do strictly charge and require all Officers and Soldiers under your Command, to be obedient to your Orders as First Lieutenant. And you are to observe and follow such Orders and Directions as you shall from Time to Time receive from the Supremem Executive Council of this Commonwealth, or from your superior Officers, according to the Rules and Discipline of War, and in Pursuance of the Acts of Assembly of this State. This Commission to continue in Force until your Term, by the Laws of this State, shall Cousre expire. 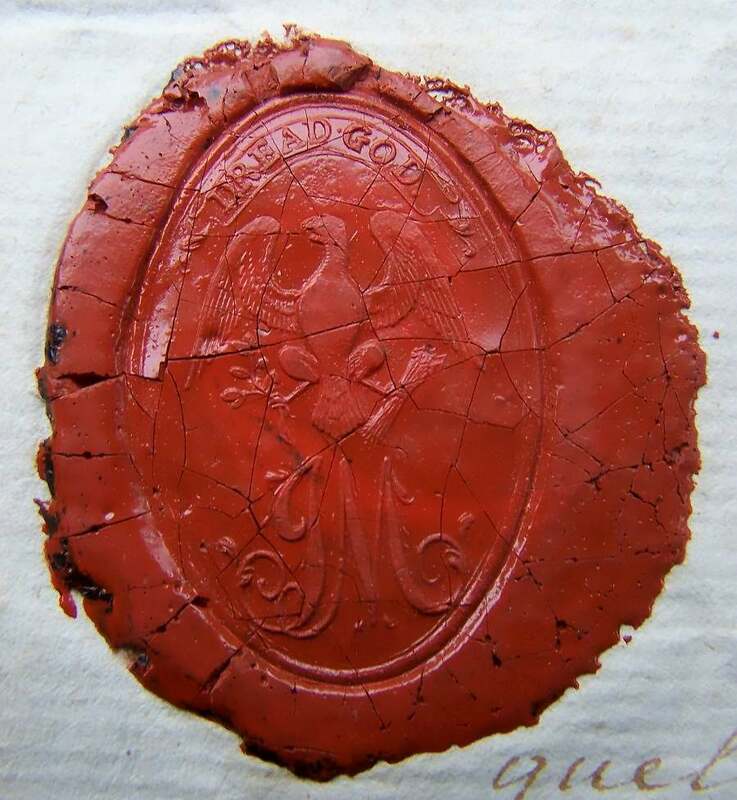 GIVEN under lesser Seal of the Commonwealth, at Lancaster, this Eighth Day of December in the Year of our Lord One Thousand Seven Hundred and Seventy seven. 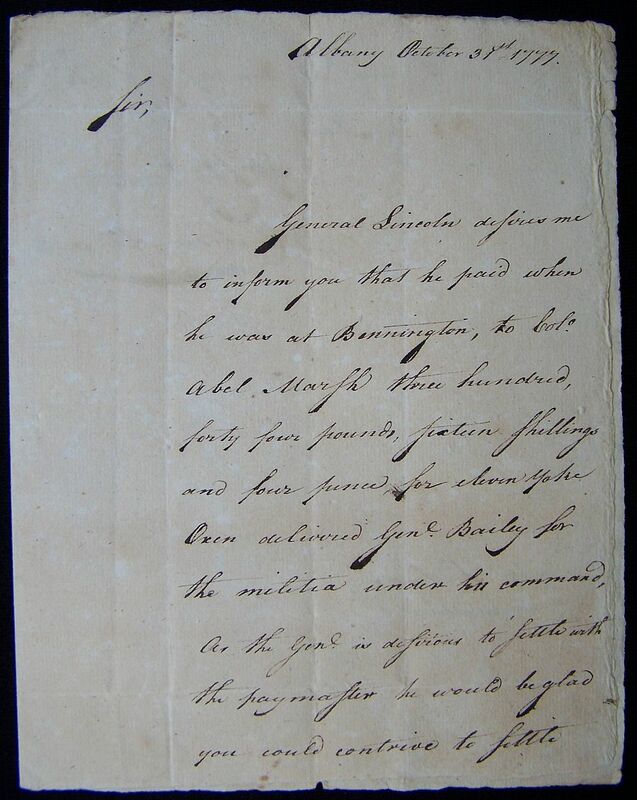 You being appointed First Major of the Boston Regiment Where of Jabez Hatch Esq. is Colonel. By Virtue of the Power Vested in us, We do by Presents, (reposing Special Trust and Confidence in your Loyalty, Courage, and good Conduct,) Commission you accordingly. You are therefore carefully and diligently to discharge the Duty of a First Major in leading, ordering, and exercising said Regiment in Arms, both Inferior Officers and Soldiers; and to keep them in good Order and Discipline: And they are hereby commanded to obey you as their First Major and you are yourself, to observe and follow such Orders and Instructions as you shall from Time to Time receive from The Major part of the Council or your Superior Officers. 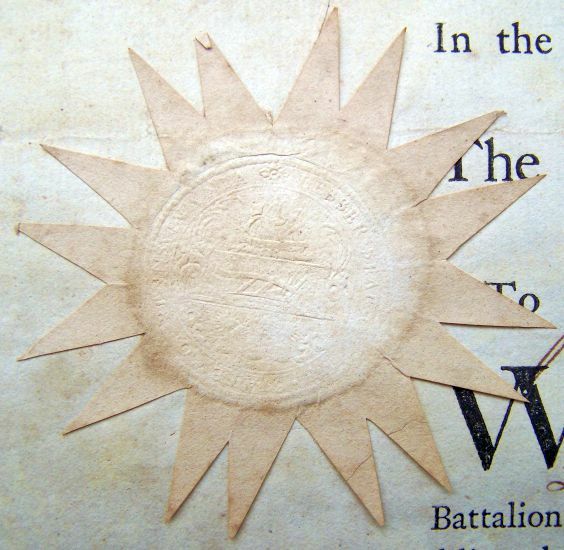 GIVEN under our Hands, and the Seal of the said State, at Boston the Eighteenth Day of July in the Year of Our Lord, 1777.
note: This is Edward Proctor’s military commission to the rank of First Major in the Boston Regiment, under Colonel Jabez Hatch dated July 18, 1777. 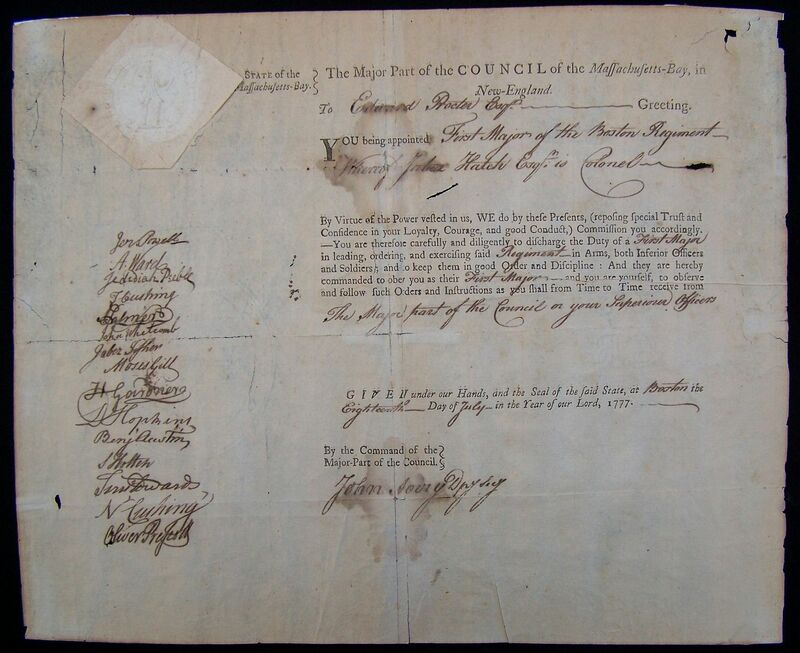 It is signed by the Major Part of the Council of Massachusetts-Bay, who at the time were Jeremiah Powell, Artemas Ward, Jedidiah Preble, Thomas Cushing III, Joseph Palmer, John Whitcomb, Jabez Fisher, Moses Gill, Henry Gardner, Daniel Hopkins, Benjamin Austin, Samuel Holton, Timothy Edward, Nathaniel Cushing, Oliver Prescott, and Deputy Secretary John Avery. 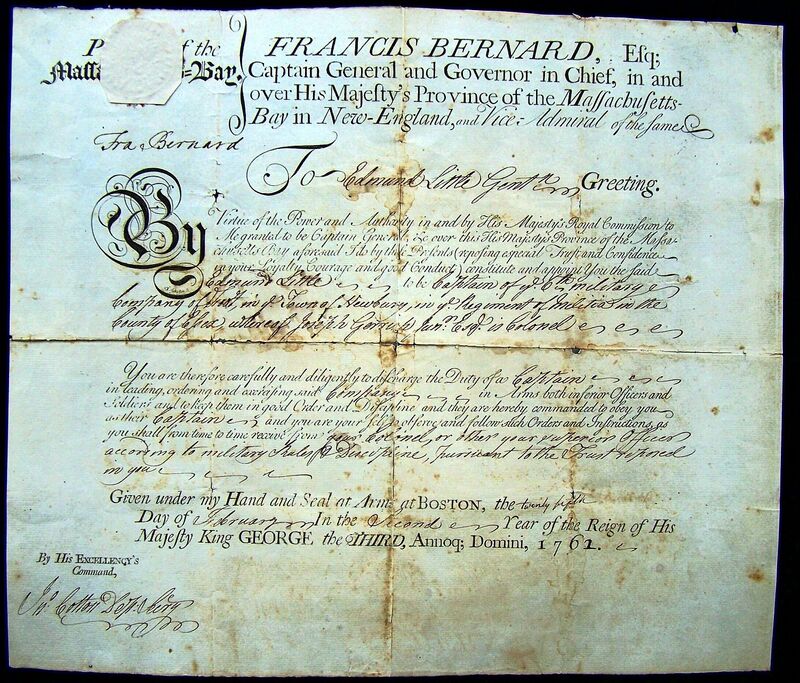 You being appointed First Lieutenant of a Company of Matrosses commanded by Seth Lane in the town of Norton in the Brigade of Militia in the County of Bristol where of George Godfrey Esq. Is Brigadier. By Virtue of the Power Vested in us, We do by Presents, (reposing Special Trust and Confidence in your Loyalty, Courage, and good Conduct,) Commission you accordingly. You are therefore carefully and diligently to discharge the Duty of a First Lieutenant in leading, ordering, and exercising said Regiment in Arms, both Inferior Officers and Soldiers; and to keep them in good Order and Discipline: And they are hereby commanded to obey you as their First Lieutenant and you are yourself, to observe and follow such Orders and Instructions as you shall from Time to Time receive from The Major part of the Council or your Superior Officers. 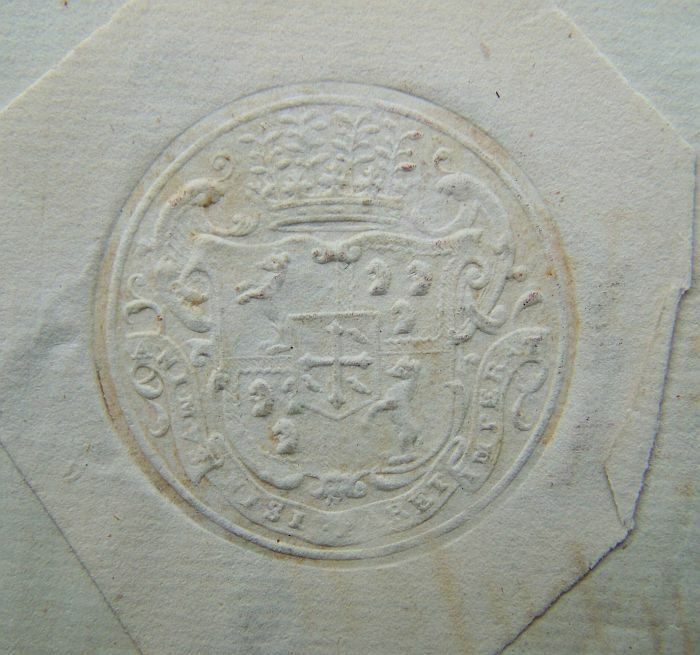 GIVEN under our Hands, and the Seal of the said State, at Boston the Thirtieth Day of July in the Year of Our Lord, 1778. Bristol Is. 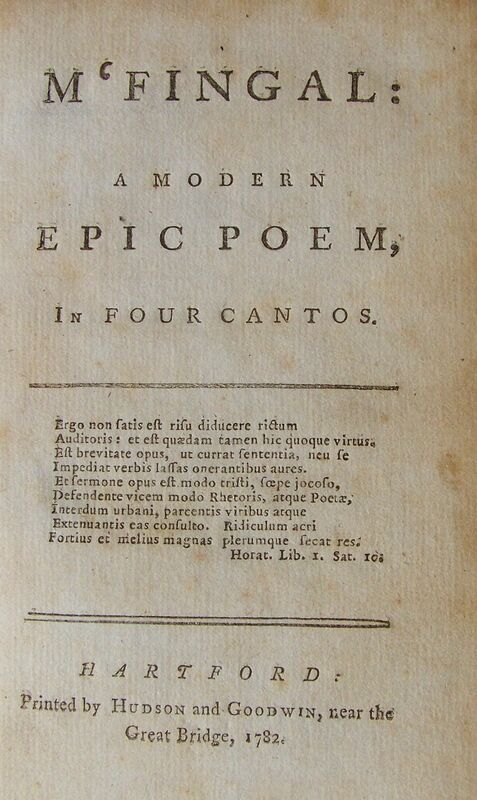 Norton the 13th of November 1778. Then Personally appeared Ephraim Lane and was sworn to the faithfull discharge of the draft Repose in him by this commission before me. 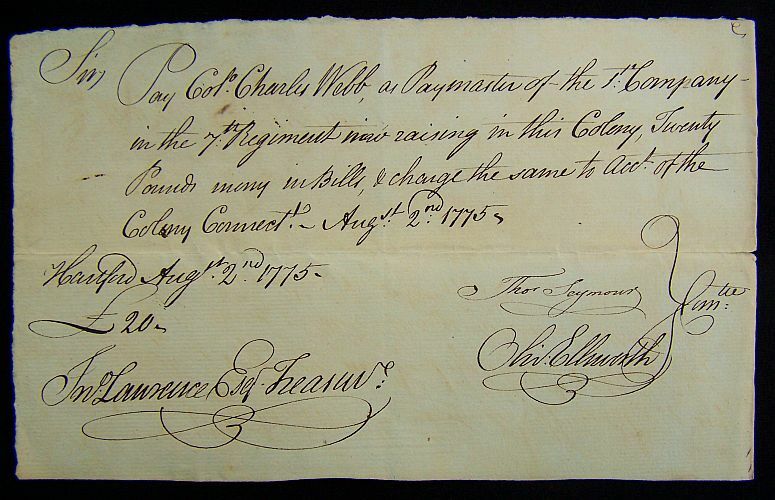 note: George Godfrey was commissioned to Brigadier General on January 30, 1776. 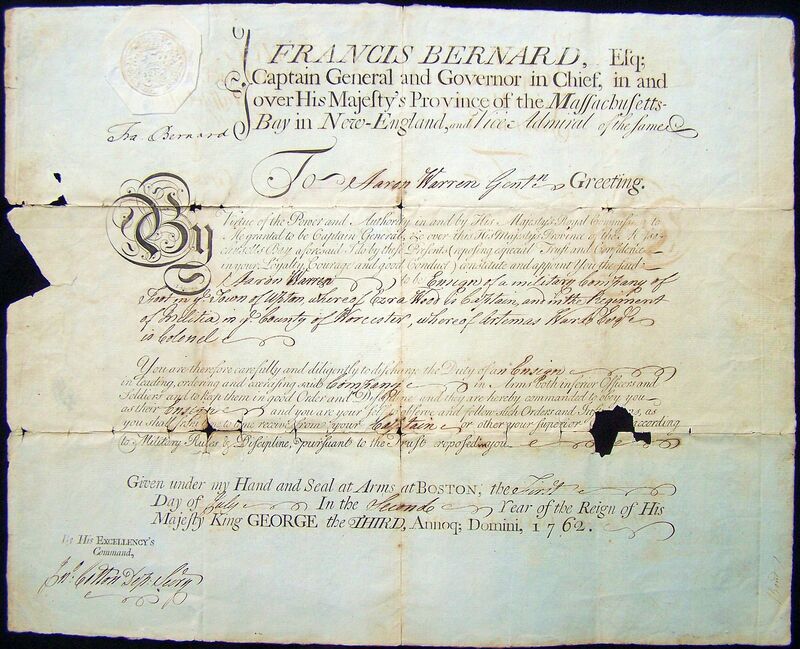 Godfrey would fight as a private during the French & Indian War. in Chief of the State of Connecticut. To Daniel Dunham Gentleman GREETING. 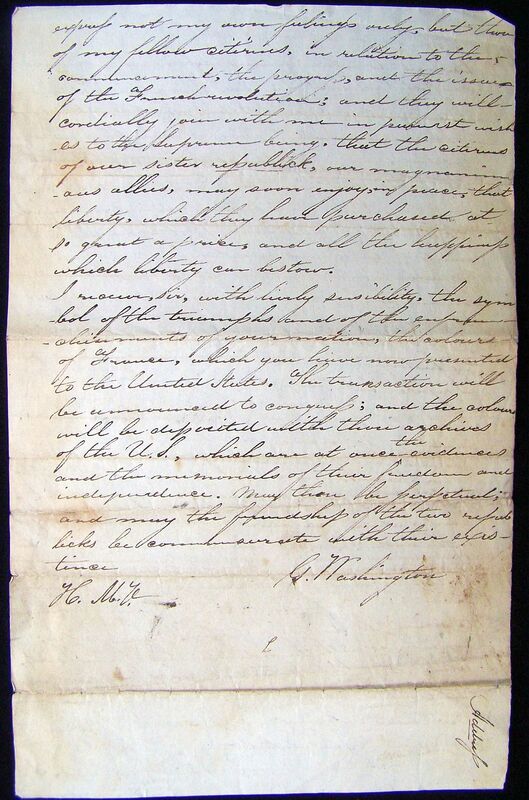 You being agreeable to an Act of the General Assembly in February last appointed to be Lieutenant of a Company in the 5th Battalion order to be raised for the Defense of this and the United States pursuant to a presolve of the Assembly. Reposing especial Trust and Confidence in you Fidelity, Courage, and good Conduct, I do, by Virtue of the Laws of this State, me there unto enabling, appoint and impower you the said Daniel Dunham to be Lieutenant and said Company. You are therefore carefully and diligently to Discharge the Duty of a Lieutenant in Leading, Ordering, and Exercising said Company in Arms, both Inferior Officers and Soldiers, in the Service afore said, and to keep them in good Order and Discipline, hereby Commanding them to obey you as their Lieutenant and yourself to observe and follow such Orders and Instructions, as you shall from Time to Time receive from me, or the Commander in Chief of said State, for the Time being, or other your Superior Officer, according to the Rules and Discipline of War, Pursuant to the Trust hereby reposed in you. 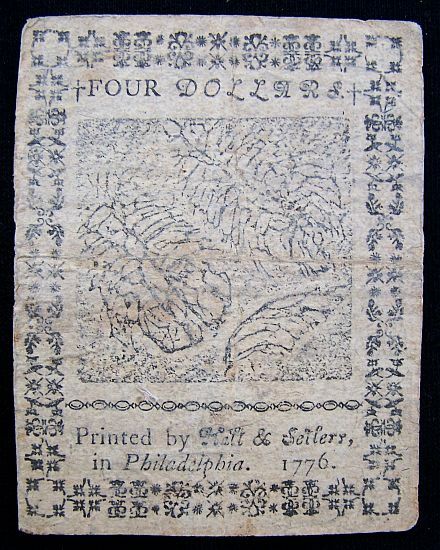 Given under my Hand and Seal at Arms, in Lebanon the 26th Day of March Anno Domini, 1778.
note: Daniel Dunham would answer the call at Lexington, and would march with George Washington to New York in 1776. 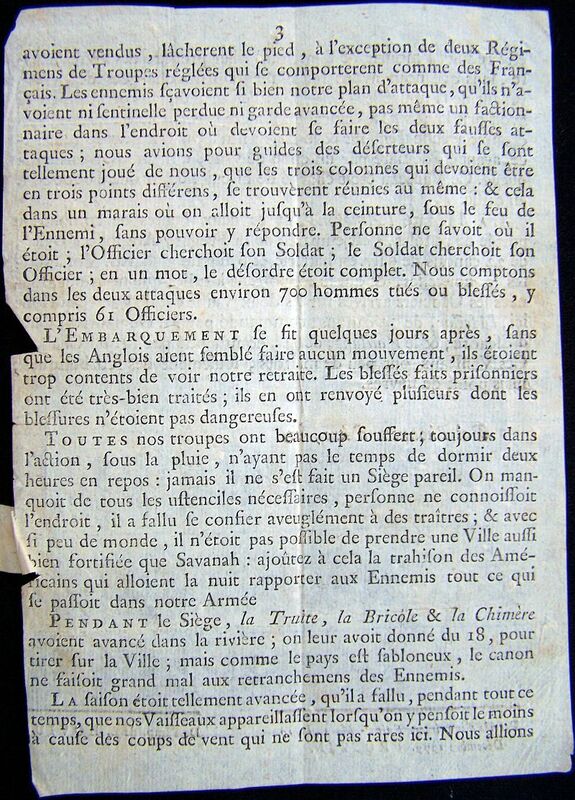 L’Orient, le 13 Décembre 1779. 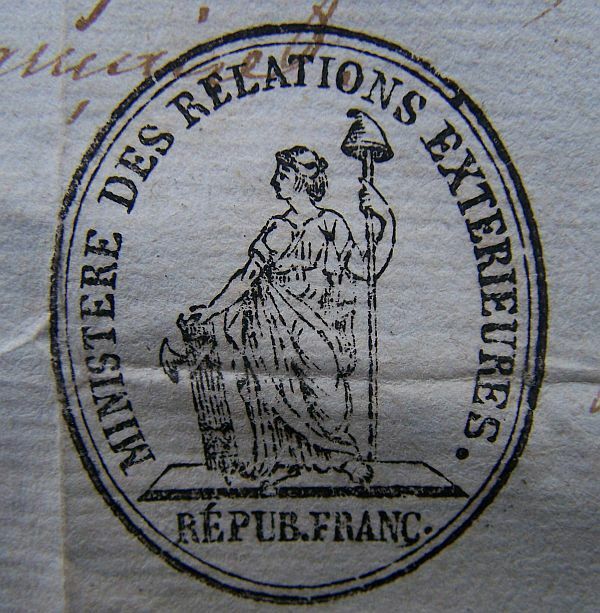 Il a été publié déjà bien des Relations sur l’affaire de Savanah, peut-être ne serez-vous pas fàché d’en voir un vrai détail, qu’un Ami, témoin de cette Affaire, vient de m’envoyer. Après avoir quitté le Convoi du Protecteur & du Fier, nous avons fait route pour la Nouvelle Angleterre, sans savoir précisément où nous allions; nous présumions cependant bien que nous ne pouvions pas monter beaucoup au Nord, ayant trèspeu de vivres & d’eau. Le 2 Sep., nous vîmes la terre & nous moui’lâmes à II lieues de distance, après avoir eu des Pilotes que l’on avoit envoyé chercher, nous appareillàmes pour mouiller à quatre lieues de Taibay, qui est à l’entrée de la rivière de Savanah. Il ne nous fut pas possible d’approcher davantage de terre ayant peu de fond, beaucoup de bancs & une forte barre qui se faisoit entendre de loin. Quelques jours après notre arrivée on fit le débarquement à deux lieues fous le vent du mouillage; on y employa plusieurs jours, vu la difficulté de trouver le passage de la rivière, qui, dans une étendue de huit lieues avant d’arriver à Savanah, est pleine de bancs & sinuosités. 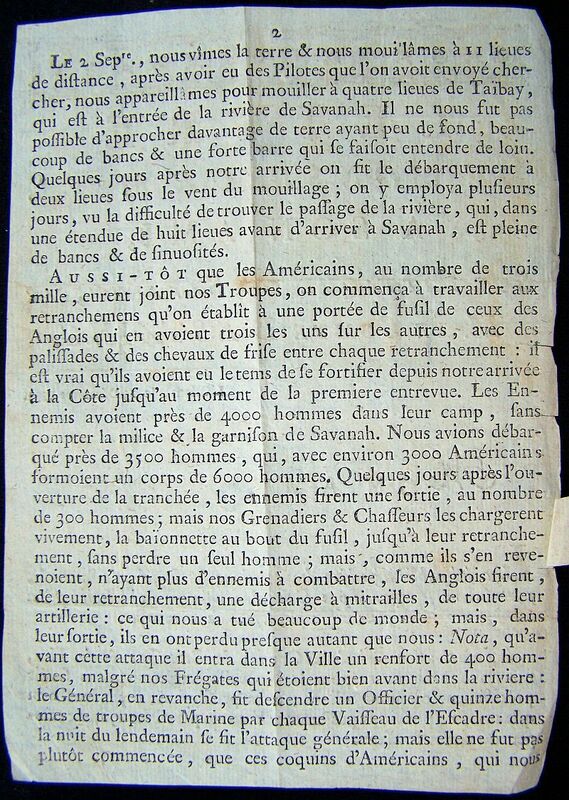 Aussi-Tôt que les Américains, au nombre de trois mille, eurent joint nos Troupes, on commenca à travailler aux retranchemens qu’on établît à une portée de fusil de ceux des Anglois qui en avoient trois les uns sur les autres, avec des palissades & des chevaux de frise entre chaque retranchement: il est vrai qu’ils avoient eu le tems de se fortifier depuis notre arrivée à la Côte jusqu’au moment de la premiere entrevue. Les Ennemis avoient près de 4000 hommes dans leur camp, sans compter la milice & la garnison de Savanah. Nous avions débarqué près de 3500 hommes, qui, avec environ 3000 Américains formoîent un corps de 6000 hommes. 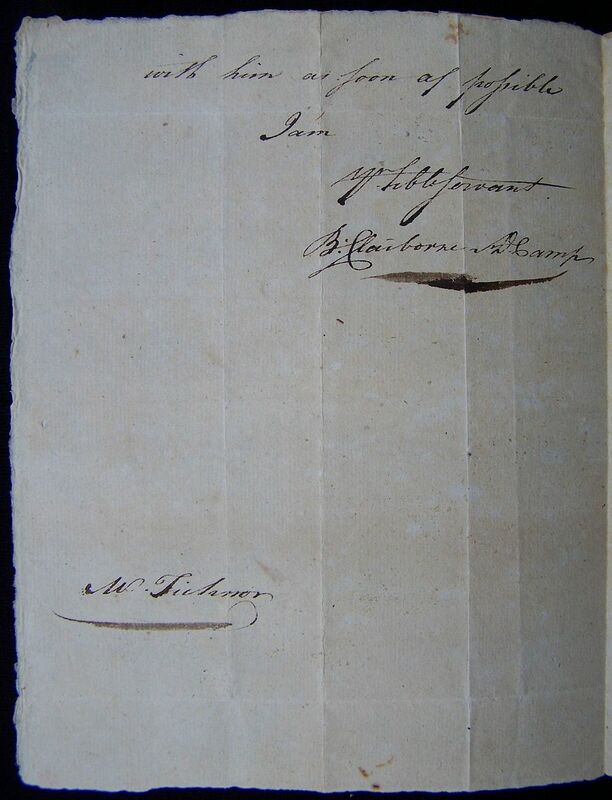 Quelques jours après l’ouverture de la tranchée, les ennemis firent une sortie, au nombre de 300 hommes; mais not Grenadiers & Chasseurs les chargerent vivement, la baïonnette au bout de fusil, jusqu’a retranchement, sans perdre un seul homme; mais, comme ils s’en sirent, de leur retranchement, une décharge à mitrailles, de toute leur artillerie: ce qui nous a tué beaucoup de monde; mais, dans leur sortie, ils en ont perdu presque autant que nous: Nota, qu’avant cette attaque il entra dans la Ville un renfort de 400 hommes, malgré nos Frégates qui étoient bien avant dans la riviere: le Général, en revanche sit descendre un Officier & quinze hommes de troupes de Marine par chaque Vaisseau de l’Escadre: dans la nuit du lendemain se sit l’attaque générale; mais elle ne fut pas plutôt commencée, que ces coquins d’Américains, qui nous avoient vendus, lâcherent le pied, à l’exception de deux Régimens de Troupes réglées qui se comporterent comme des Français. Les ennemis scavoient si bien notre plan d’attaque, qu’ils n’avoient ni sentinelle perdue ni garde avancée, pas même un factionaire dans l’endroit où devoient se faire les deux fausses attaques: nous avions pour guides de déserteurs qui se sont tellement joué de nous, que les trois colonnes qui devoient être en trois points différens, se trouvèrent réunies au même: & cela dans un marais où on alloit jusqu’à la ceinture, sous le sue de l’Ennemi, sans pouvoir y répondre. Personne ne savoit où il étoit; l’Officier cherchoit son Soldat; le Soldat cherchoit son Officer; en un mot, le désordre étoit complet. Nous comptons dans les deux attaques environ 700 hommes tués ou blessés, y compris 61 Officiers. L’Embarquement se sit quelques jours après, sans que les Anglois aient semblé saire aucun mouvement, ils etoient trop contents de voir notre retraite. Les blessés faits prisonniers ont été très-bien traités; ils en ont renvoyé plusieurs dont les blessures n’étoient pas dangereuses. Toutes nos troupes ont beaucoup souffert; toujours dans l’action, sous la pluie, n’ayant pas le temps de dormir deux heures en repos: jamais il ne s’est sait un Siège pareil. 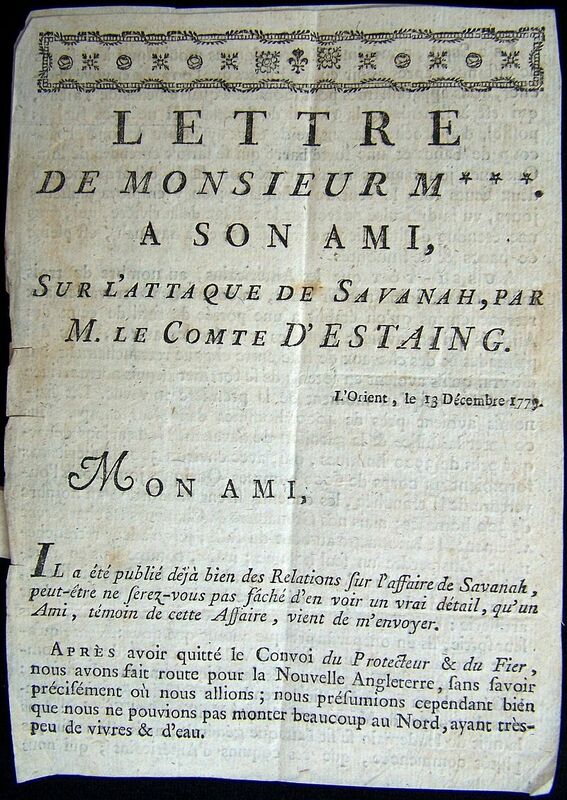 On manquoit de tous les ustenciles nécessaires, personne ne connoissoit l’endroit, il a fallu se confier aveuglément à des traîtres; & avec si peu de monde, il n’étoit pas possible de prendre une Ville aussi bien fortifiée que Savanah: ajoûtez à cela le trahison des Américains que alloient la nuit rapporter aux Ennemis tout ce qui se passoit dans notre Armée. Pendant le Siège, la Truite, la Bricole & la Chimère avoient avancé dans rivière; on leur avoit donné du 18, pour tirer sur la Ville; mais comme le pays est abloneux, le canon ne faisoit grand mal aux retranchemens des Ennemis. La saison étoit tellement avancée, qu’il fallu, pendant tout ce temps, que nos Vaisseaux appareillassent lorsqu’on y pensoit le moins à cause des coups de vent qui ne sont pas rares ici. Nous allions etre réduits à mourir de faim, ou a aller prendre des vivres à terre, sans que nous avons fait plusieurs prises chargées de vivres, venant de la nouvelle York, sous l’escorte de l’Experiment, qui avoit pris la Danaé à Cancalle: il a été pris par le Sagittaire, qui croisoit avec le Fendant & le Zelé; il n’a pas fait grande résistance, ayant été démâté par un coup de vent, dont nous avons eu la queue. Ce Vaisseau étoit chargé de biscuit, & en outre 800000 l. en caisse. 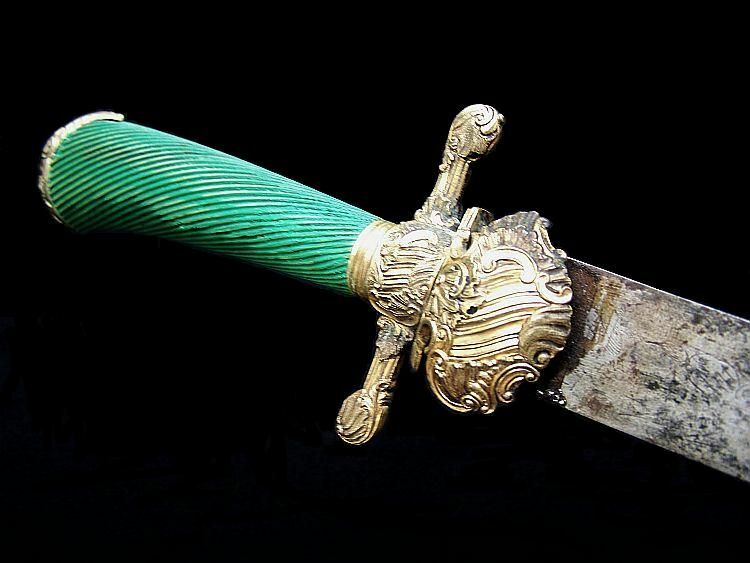 La Frégate l’Amazone, après deux heures de combat, à portée de pistolet, s’est emparée de la Frégate Angloise l’Uriel, de 22 canons de 9 liv. en batterie & 6 sur les gaillards. 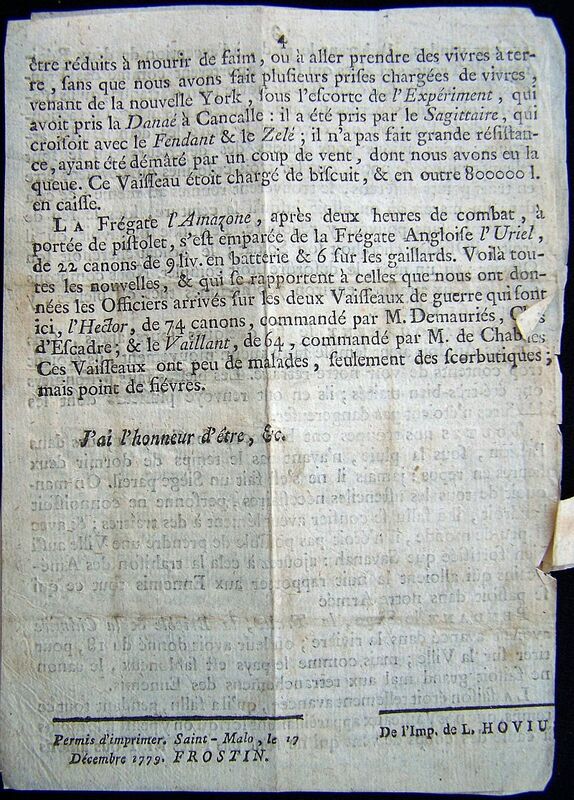 Voilà toutes les nouvelles, & qui se rapportent à celles que nous ont données les Officiers arrivés sur les deux Vaisseaux de guerre qui sont ici, l’Hector, de 74 canons, commandé par M. de Demauriés, Chef d’Escadre; & le Vaillant, de 64, commandé par M. de Chabert. Ces Vaiss ont peu malades, feulement des scorbutiques; mais point de fiévres. 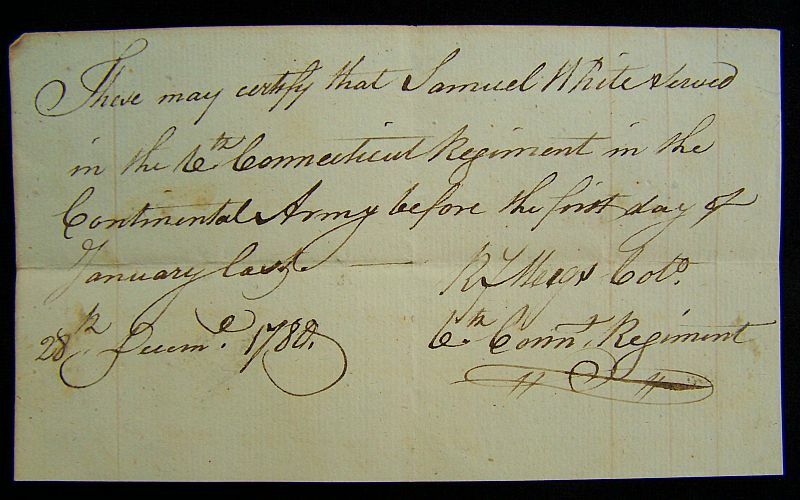 These may certify that Samuel White served in the 6th Connecticut Regiment in the Continental Army before the first day of January last. 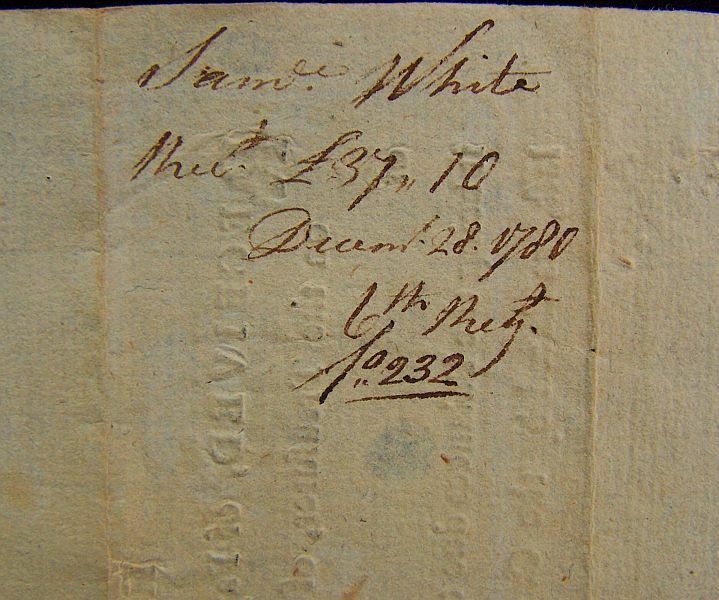 note: This is Private Samuel White’s pay for his service in Colonel Meigs 6th Connecticut Regiment for the year 1780. 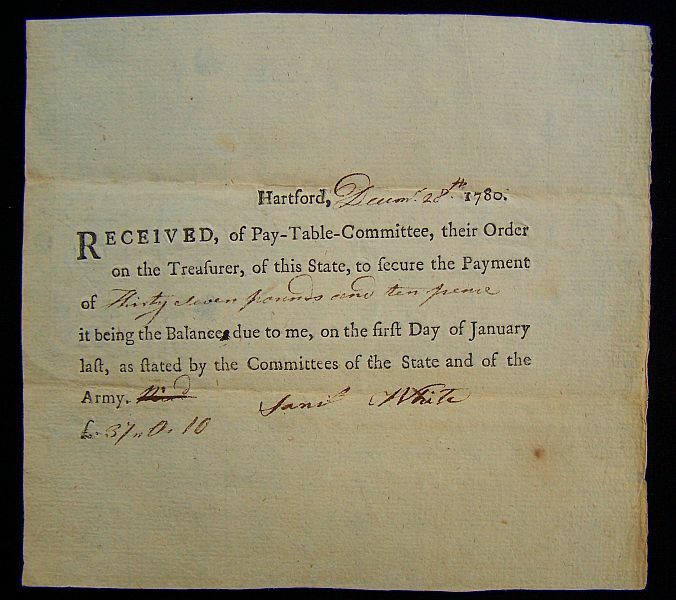 RECEIVED, of Pay-Table-Committee, their Order on the Treasurer, of this State, to secure the Payment of Thirty seven pounds and ten pence it being the Balance due to me, on the first Day of January last, as stated by the Committees of the State and of the Army. 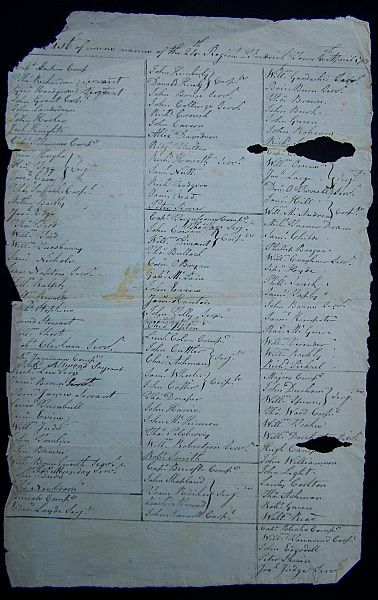 This is a muster roll of British Pow’s of the 24th Regiment who had surrendered at Saratoga. 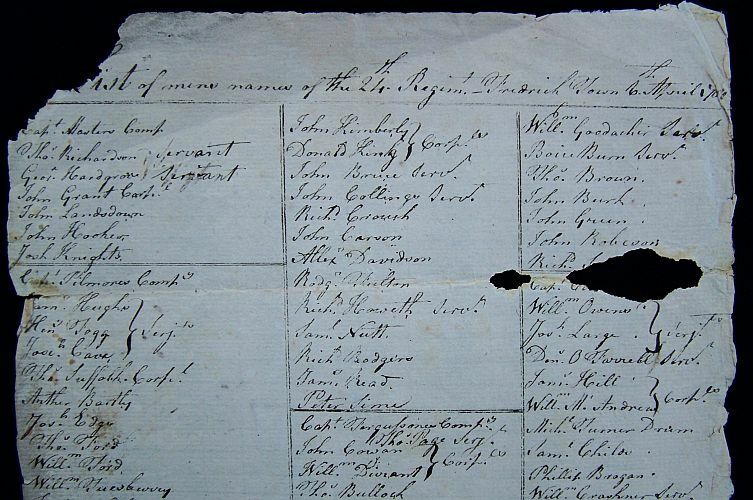 The roll is dated the 6th of April 1781, at a camp in Fredrickstown, Maryland. THE above Jean B. Dupere has been honored with the BADGE of MERIT for five Years faithful Service. note: Brigadier General Moses Hazen would serve throughout the war, and in 1781 he would be with the Marqui de la Fayette at Yorktown. 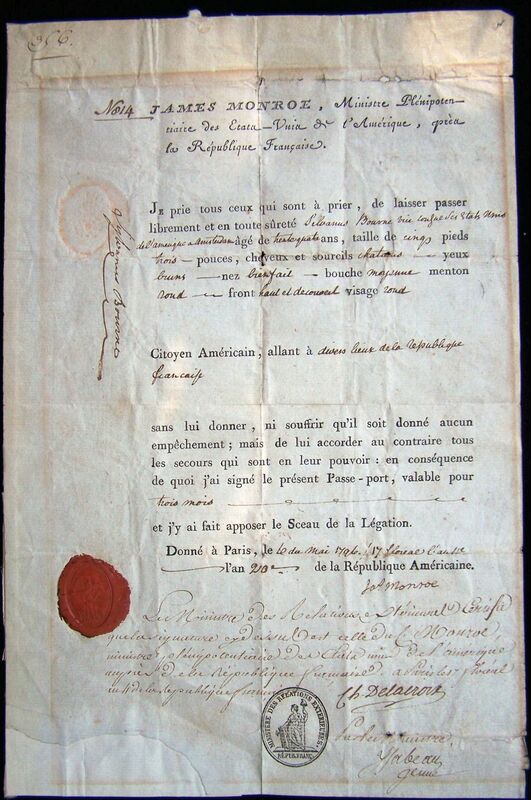 John Baptiste Dupere was a French Canadian who would volunteer and serve in Hazen’s Regiment. He would also find himself at Yorktown fighting the British. Dupere would be awarded the Badge of Merit for his service. I now send off 3 servants with 10 horses and 2 wagons to Albany, asks that the horses go to the public stables and the men have quarters. If they get to Albany before Stirling he requests Quackenbush see that they get plenty of good forage and asks that he look for a place for my Aids De Camp to Quarter at as near to Mr. Duer as possible. To the principal SURVEYOR of the Lands set apart for Officers and Soldiers of the Commonwealth of VIRGINIA. 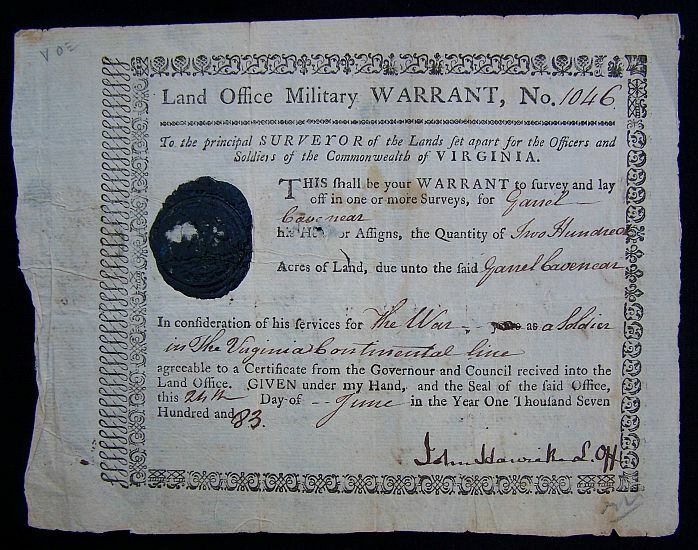 This shall be your WARRANT to survey and lay off in one or more Surveys, for Garret Cavenear, the Quantity of Two Hundred Acres of Land, due unto said Garret Cavenear In consideration of his services for The War as a Soldier in the Virginia Continental Line agreeable to a Certificate from the Governor and Council received into the Land Office. Given under my Hand, and seal of the said Office, this 24th Day of June in the Year One Thousand Seven Hundred and 83. I do hereby sign over all my right and interest of the written warrant No. 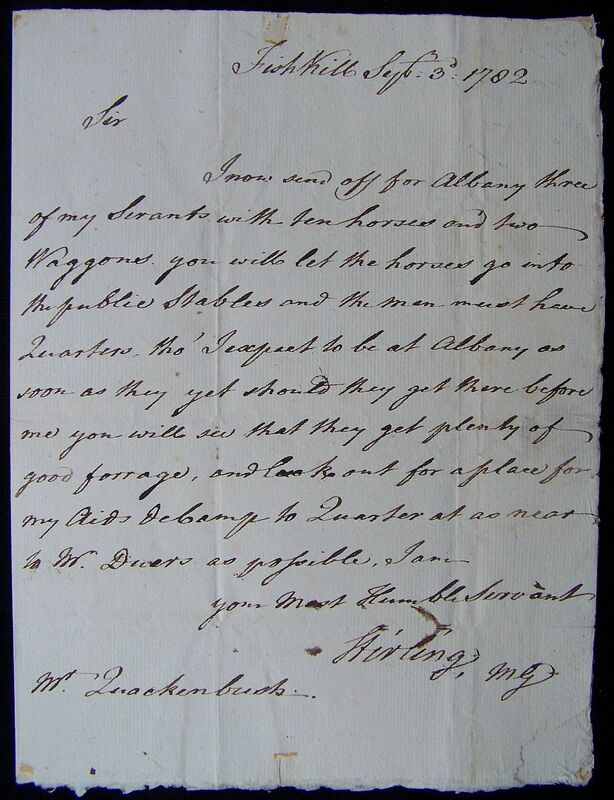 1046 Grant to me by the Sate of Virginia for my service as a soldier of the Virginia Continental Line to Alsner Fowler, he having paid me, therefore it may be surveyed for him and. . . . .Given under my hand this 21st day of June 1784. On the 27th day of June 1836 before me Benjamin C. Franklin Judge in & for the district of Brazos appeared Hugh Miller Late of Capt Romans Camp. 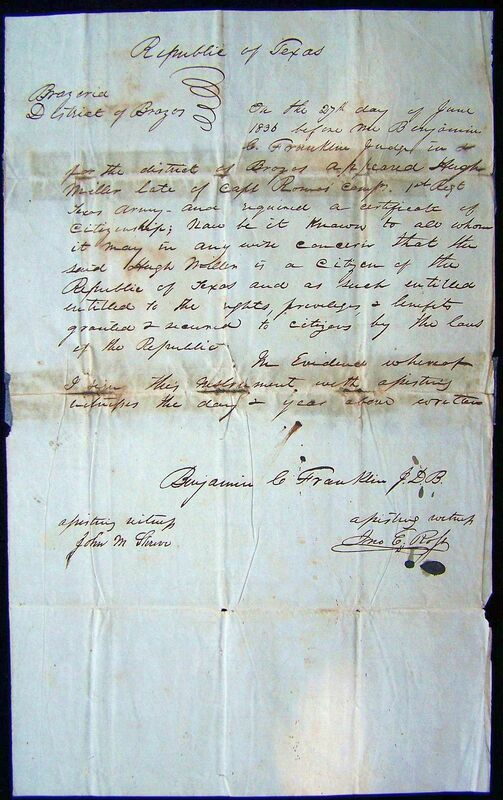 1st Regt Texas Army – and required a certificate of Citizenship; Now let it be known to all whom it may in any with concern that the said Hugh Miller is a Citizen of the Republic of Texas and as such entitled to the rights, privileges, & benefits granted & secured to citizens by the laws of the Republic. The Evidence whereof I sign this Instrument with assisting witnesses the day & year above written. 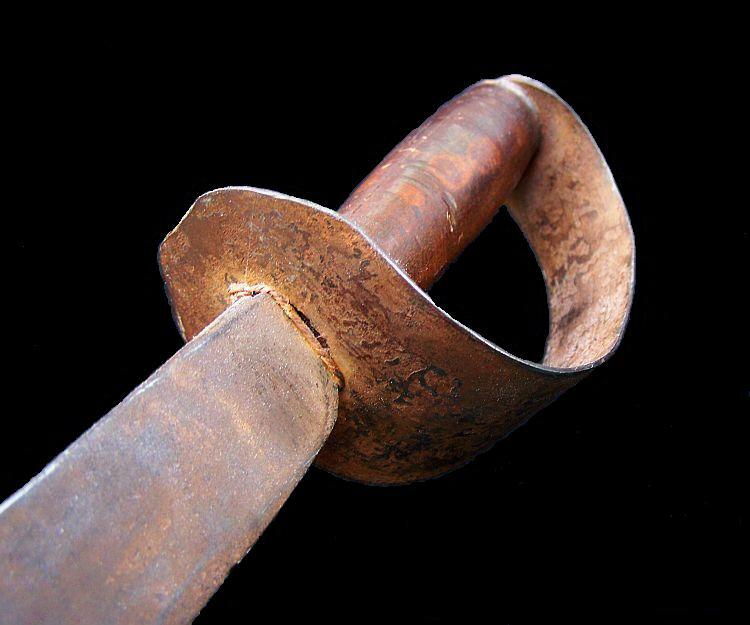 note: Private Hugh Miller, of Captain A. Richard Roman’s 1st Regiment, had fought at the Battle of San Jacinto on April 21, 1836. 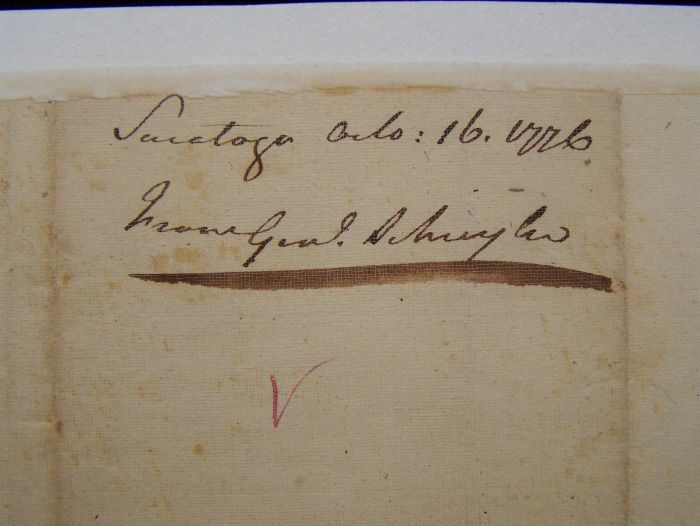 Miller was killed at Quintana, Brazoria County, in 1837. Know all Men by the presents. 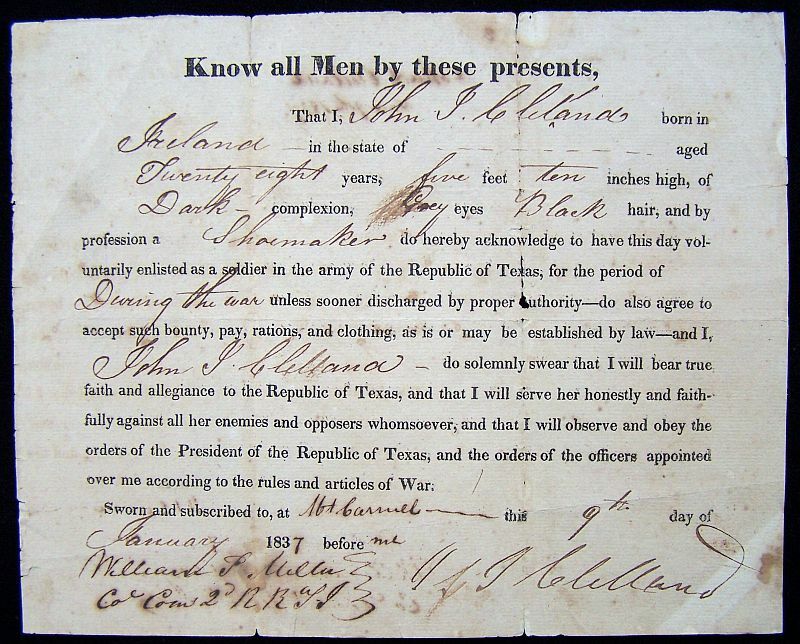 That I, John J. Clelland born in Ireland in the state of —— aged Twenty Eight years, five feet ten inches high, of Dark complexion, Grey eyes Black hair, and by profession a Shoemaker do hereby acknowledge to have this day voluntarily enlisted as a soldier in the army of the Republic of Texas, for the period of During the War unless sooner discharged by proper authority — do also agree to accept such bounty, pay, rations, and clothing, as is or may be established by law — and I, John J. Clelland do solemnly swear that I will bear true faith and allegiance to the Republic of Texas, and that I will serve her honestly and faithfully against all her enemies and opposers whomsoever, and that I will observe and obey the orders of the President of the Republic of Texas, and the orders of the officers appointed over me according to the rules and articles of War. 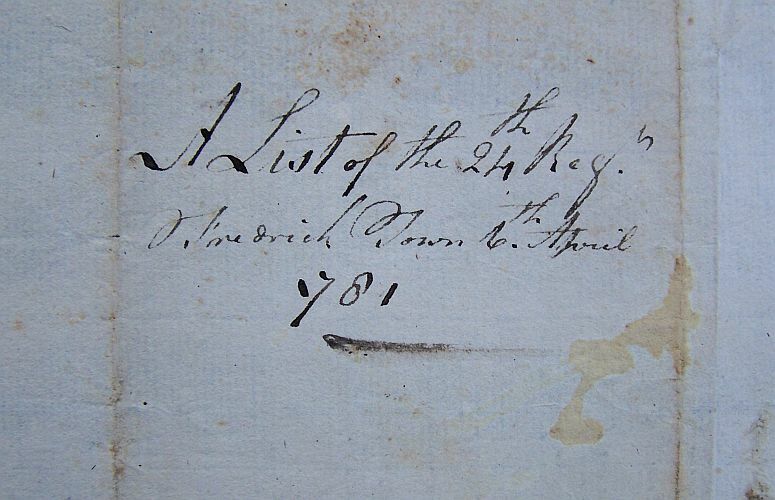 note: Colonel William P. Miller (1802-1862). Colonel of the 2nd Texas Infantry. 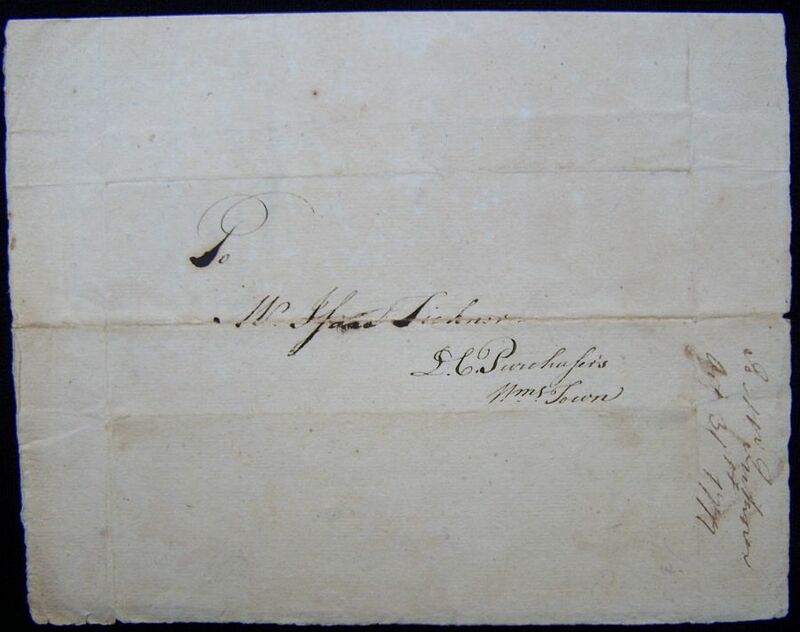 note: The note has a secretarial signature of General Sam Houston.